While trawling Instagram for watch pics, I discovered this little gem posted by watch nerd and craftsman Ethokin. He took an inexpensive leather strap and replaced the stitching with turquoise thread to match the hands on his modded Seiko. It is simple, cool, and best of all, super cheap. Here's how it's done. He used a leather Fossil strap that was on sale for $5.00. The old stitching was pulled out with a seam ripper, which is a tool with a forked end forming a small blade. You can find them at any craft store for a couple bucks. Using a heavy leather needle using 1mm waxed cotton thread (as little as $1.75 a spool on eBay), he stitched it forward and back again, tied off the end, and secured it with E6000 adhesive. Voilà! 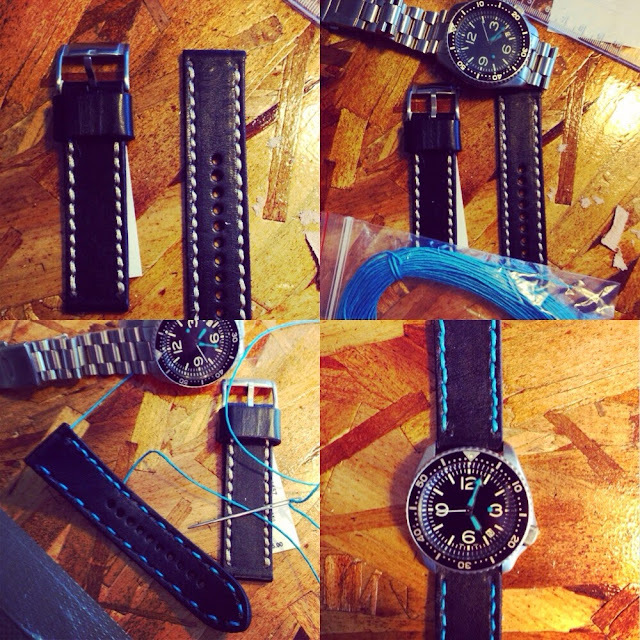 Custom strap for custom watch. You can follow @Ethokin on Instagram for other watch pics, and also check out his hand made watch rolls and small leather goods at @decamp_goods.